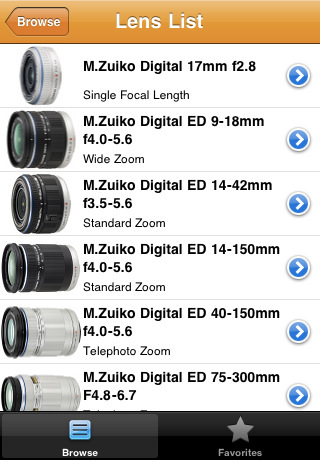 The Mirrorless Lenses app allows you to browse the full range of mirrorless interchangeable lens camera (MILC) lenses. 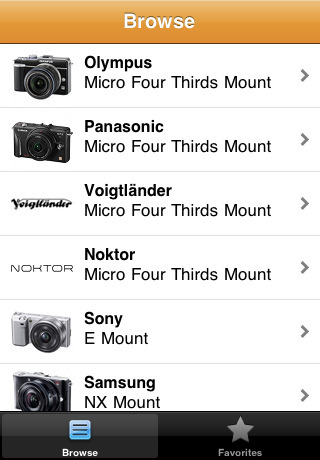 It allows you to browse all the camera and lens manufacturers based on the lens mount. This includes Micro Four Thirds, Sony E, Samsung NX and Four Thirds Mount lenses. This app allows you to add lenses to a Favorites page so you can keep an inventory of what lenses you own or which lenses you want to have on your wish list. When you bring up the page for an individual lens, it shows you a picture of the lens as well details for the lens. Lens details include the type of lens, focal length, maximum and minimum apertures, filter size, dimensions and weight. This entry was posted in Apple, Noktor, Olympus, Panasonic, Samsung, Sony and tagged iPhone apps. Bookmark the permalink. Trackbacks are closed, but you can post a comment.